Pregnancy pillows are among the top gifts for pregnant wife, if not the very top. Having one is a pregnancy must have item. This post will present to you only the very best pregnancy pillow for back sleepers. A good pregnancy pillow is such a necessity that the woman will create one from her old pillows if she doesn’t have one. I have had a friend do exactly that. She would have one pillow for the head, one for the legs and one for the back. And you can imagine that these pillows would be hard to keep in same place. At some point some pillow would not be in the right spot so there is the battle to keep them in line. Sounds exhausting doesn’t it? And all this happening during the time when she was suppose to rest and relax. So why not make things easier and get a specially designed pregnancy pillow. Only someone who has felt the discomfort a pregnancy can cause will truly understand how important having a good body support is. During pregnancy the body of the woman changes and these changes are not naive. She may have a hard time finding a comforting position, she may have various pains and swells. All this can lead to a sleep deprivation both for the woman and the husband. And getting a good, refreshing sleep during pregnancy is something that a woman must have. The husband must get a proper rest as well to be able to do his work and provide for the family. Making mistakes at work because of lack of good sleep is something he can’t afford specially with a baby on the way. 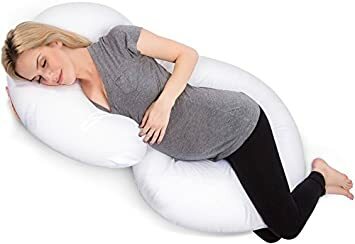 Since a pregnancy pillow is so necessary why not get it as gift? It’s a practical and a beautiful gift and the best thing about it is that it will be used after pregnancy as well. Some of these pillows help with breast feeding. And having a nice, comforting pillow to help her sleep better and relax is something no woman can refuse. What Is The Best Pregnancy Pillow For Back Sleepers? I just counted the number of pillows I sleep with and the magic number is 3. Three pillows and I am not even pregnant. One is anatomically shaped pillow but when I check my smart phone in bed I need one more for height. That’s my second decorative pillow which surprisingly turned out very comfortable. One is a ridiculously expensive pillow – a gift from my mom. It costs about 200 dollars and goes for throwing one leg above it. Crazy… So if I need this many pillows for a great night sleep then a pregnant woman surely needs – and deserves – the best pillow solution out there. The lower part is slightly curved and goes between your legs – this is probably the most comfortable position for your legs when lying in bed. I can’t imagine sleeping on my side without having a supporting pillow for my knees. Highly recommended for heartburn troubles. It is because the pillow supports multiple positions during the night and especially is good for supporting the upper part of the body, in an upright position, which minimizes the effects of a heartburn. The cover is not all cotton though, it is 65% polyester and 35% cotton but if you are looking for 100% cotton you can check this one here. It’s a high quality pillow which will not loose it’s supporting ability due to an extensive use during pregnancy months. It is also specially designed to accommodate a women’s fuller figure during pregnancy. This pregnancy pillow is a perfect gift idea for pregnant wife from husband. It will turn nights into a more pleasurable experience, it will minimize pregnancy pains and aches and your family, including the little member, will get the best sleep possible. What Is The Best Pregnancy Pillow To Buy As A Gift For A Pregnant Woman? It has 100% cotton cover. This means you will have great airflow and won’t overheat during the night. This is the only material to go for in summer if you ask me. It is pregnancy safe as the product is Phthalate free, latex free, lead free and BPA free. It is designed with your best health on mind. Most important features: this total body pillow will allow you to sleep better, feel very comfortable, eliminate tossing and turning in the middle of the night, help your body deal with various pains during pregnancy. This pillow can be used for pregnancy, can be used both by the wife and the husband, it will help during nursing times and last but not least it will be used even after the pregnancy is over. It is also one of the best gifts for expectant mom. This is definitely my favorite sleep pillow. I mean just look at the design – so cheerful and so optimistic looking. I can’t imagine a woman disliking this cute pillow. And it is exactly the design that makes this pillow a wonderful gift for a pregnant woman. You will have both an attractive looking pillow with all the practical features in it. And I can tell you something else: people are buying this pillow like crazy, I know because I have sold lots of it by recommending it. It has a simple C shape design but this simplicity will allow you to replace five or more pillows in one. It will give you support for your back, for your legs, for the tummy. When you sleep with this pillow you will feel cuddled. It will make you feel loved! It sound weird but it will give the feeling of being hugged and being supported which in return will create a subconscious emotion and this in return will make you feel so much better. So besides the body support it will also make you feel better on a psychological level. 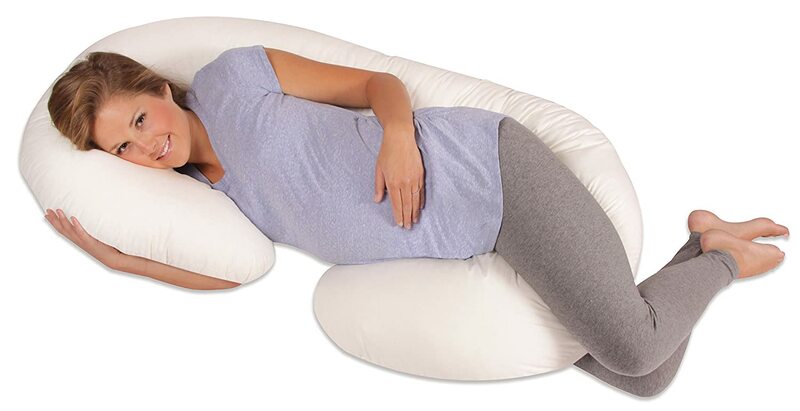 This pregnancy pillow will also be a great home decor – something no woman is immune to. It will brighten up the room and give you joyful spirit when you look at it. Perfect for relaxing a pregnant woman. Something that you will like about this pillow is the zippered cover. Some sleeping pillow don’t come with a cover and many of them don’t have a zipper. This means you can wash it easily, something you need to consider when getting a new pillow. I wash my pillows every few months and being able to do it easy and quickly is a huge relief (yes I admit I am a bit lazy). So one of the advantages of this pillow is the great looking zippered cover that comes on and off easy and quickly. Women have reported loosing their backpain during pregnancy, feeling rested after a good night sleep, having a great leg support. Overall they loved it as you can check by the superb 4.5 star rating. It comes in one size but as it is easily adjustable so any woman can find her best spot and comfortably curl in. As a gift it is very appropriate and just perfect: both practical and good looking. And she will probably use it after her pregnancy – most of the owners do. Back pain is a common symptom during pregnancy. It happens because there is additional weight that the body puts on and the back is the one carrying it mostly. As it does extra work during pregnancy it is best to add some support for the back so that the pressure will ease. A full body pillow like the above Leachco Back ‘N Belly is perfect for this purpose. You can see that the shape of this pillow is an hour glass: following exactly the curves of a woman’s body. It is the easiest pillow to use as however you turn your back and tummy are taken care of. A warning for this pillow would be to watch the size of it and if it will fit in your bed as obviously it is a huge pillow – but it will provide a huge sleeping comfort because of its size. The dimensions of this Leachco Back ‘N Belly pillow are 51 x 33.5 x 8.8 inches so you decide for yourself. It is best fitted for a king size bed. Some women complained about a seam on the top of it where the neck goes that it cuts into their skin. There is a solution if it bothers you too much: check this cover here. But as with every product there will be people that don’t like it and from the raving reviews I think it is a very solid pillow that has helped many pregnant women. No bad product could have so many positive reviews and a 4.5 star rating. It just can’t happen. So I am warmly recommending this pillow as a very good gift for mom to be. 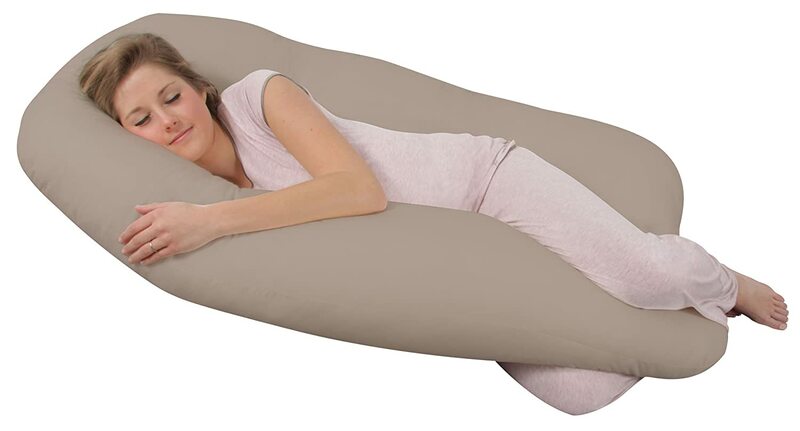 This awesome total body sleeping pillow comes in 4 colors: sky blue, espresso, almond and white. I like almond best so I have included the image here but you can go for whatever color you like best. 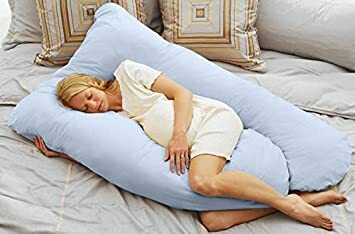 This is a perfect maternity pillow. It will provide soft sleep and enable the most comfortable position for a pregnant woman. It has no hard edges, no seam to cut into the skin and the flesh, everything is soft on this pillow. It has great shoulder support, you can tell by the large head area. It will fell like lying in heaven when you put your head on it. This pillow is designed with pregnancy on mind as it will provide excellent belly support. It also supports the woman’s weight so the body can rest properly and get strength to endure the increased body demands during pregnancy. Beside the belly support, the back is not forgotten as one of the most critical spots while being pregnant. While providing the best body support this pillow also resembles a standard pillow for the head so nothing is missing: you will feel only additional benefits from using this particular pillow. This today’s mom cozy comfort pregnancy pillow comes with a separate cover that has a zipper. Very handy for cleaning as you only have to wash the cover. I can’t imagine having to wash this giant of a pillow. So it is made really easy for maintaining. 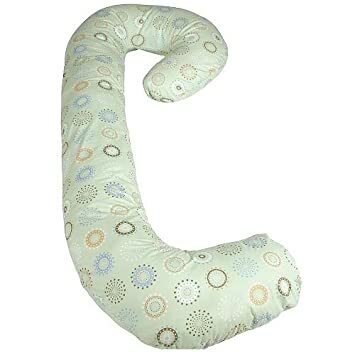 Besides being of great help during the pregnancy this pillow is also great for nursing the baby: it will keep the baby comfortable and support the mommy’s back while nursing. I would say it is well worth the money. I feel so unfortunate that this pillow does not ship to my country. 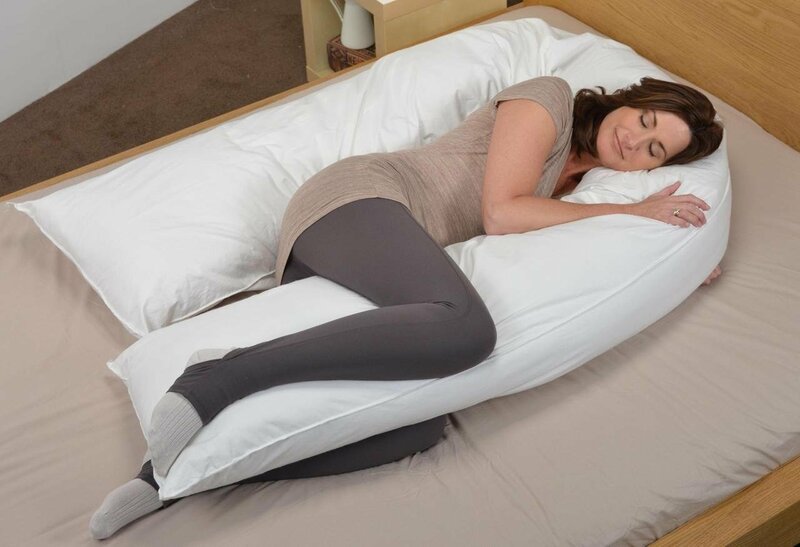 I am just looking at it and thinking to myself that every HUMAN needs a total body pillow – even with a partner. The partner will not always be in the mood for cuddling while a pillow will always provide the hugs and the cuddling – any time needed. Simply a perfect thing to have in the home. This pillow comes in 2 sizes so you can decide for yourself what is the best one for you. I really like that it is a big, giant pillow. It will provide all the comfort necessary: your head, your back, your belly, your whole body will be perfectly supported. It will fell like a baby tucked in. Is there a better way to feel than like a baby taken care of while you sleep? This is exactly what this pillow will feel like. Even just by looking at it you can tell it is a very soft (but still firm to provide the necessary support) pillow. It is made from super soft microfiber polyester shell and fill. A zippered cover is also included which is a huge relief for keeping it clean. Something a mom to be has to think about as hygiene is very important during pregnancy. There is one pretty funny review from a husband who decided to get this pillow for himself. He felt that this pillow has improved the quality of his sleep. 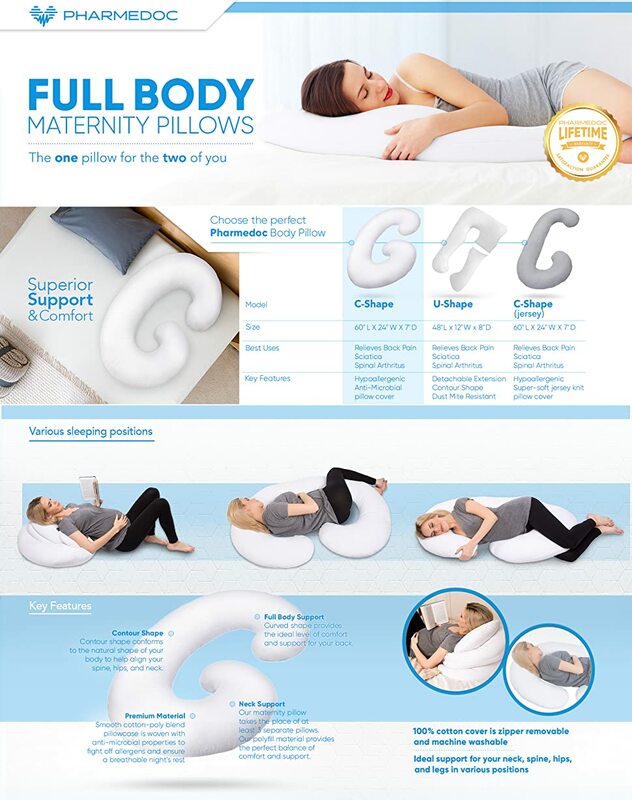 So you can imagine that if this pillow can give a satisfactory support to a man then you have nothing to worry about: it will definitely be perfect for a pregnant woman. 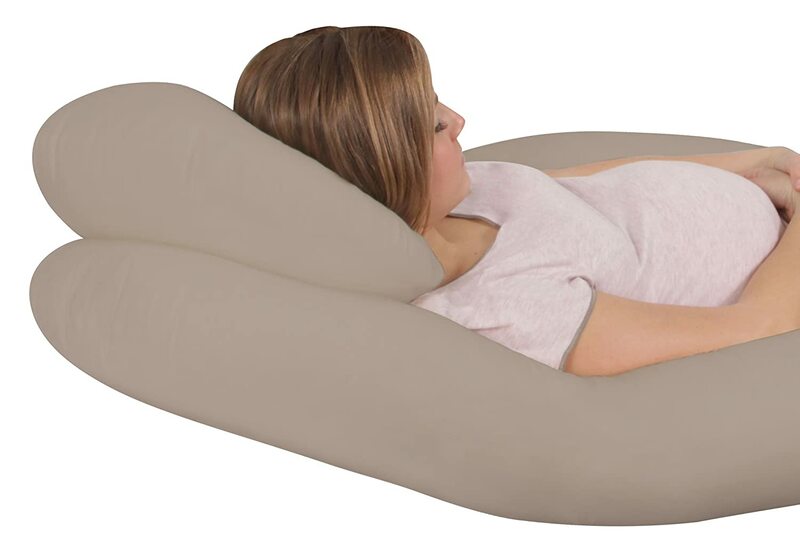 This huge, comfortable pillow will ease any woman’s life and body pain during pregnancy. That’s why it is a great gift for pregnant wife. It will show that her husband cares and thinks about her comfort and well being. And what is care if not love? So those were the best pregnancy pillow for back sleepers and you can check another type of pregnancy pillow right below. 1 What Is The Best Pregnancy Pillow For Back Sleepers? 3 What Is The Best Pregnancy Pillow To Buy As A Gift For A Pregnant Woman?